I'd do just about anything for this granddaughter of mine! 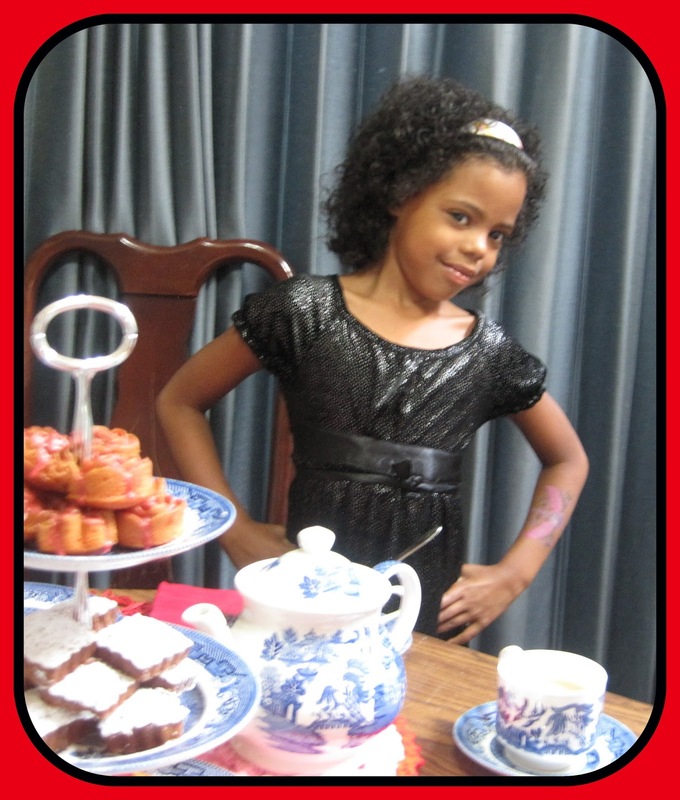 Miss Phoebe started first grade this week and she is in the Ladybug Class ... so, today, we had a Ladybug Tea Party! 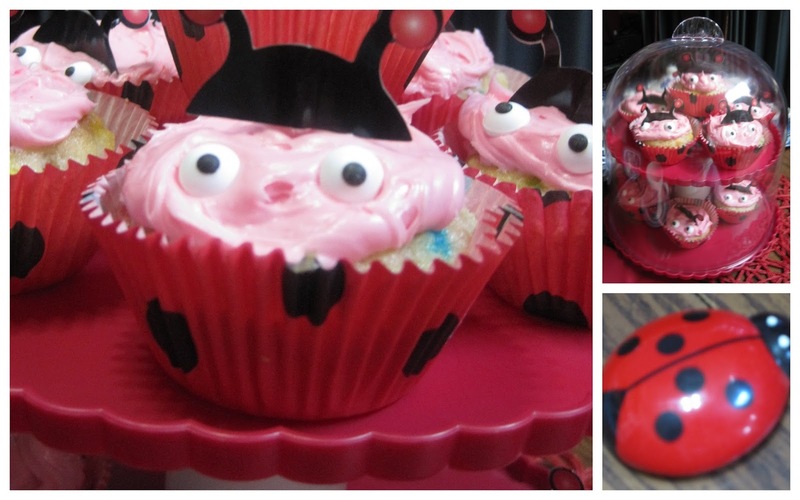 The star attraction for Phoebe ... Ladybug cupcakes! Wilton makes a cute kit ... and I couldn't resist! 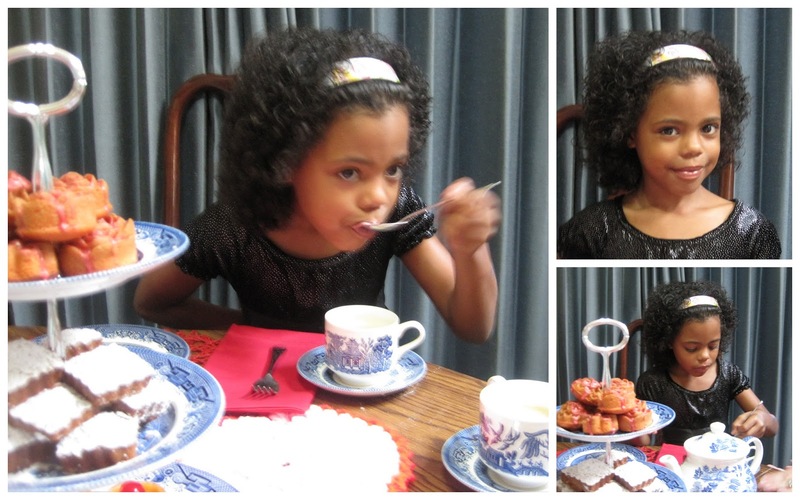 Phoebe has loved hot tea since she was old enough to understand the tea party episode of Backyardigans! We made her a fancy pot of hot tea while she watched it ... and Joe and I played tea party with her! She used a china cup, even though she was hardly old enough to hold it! I figured that if she broke it, I had about 400 more to choose from! 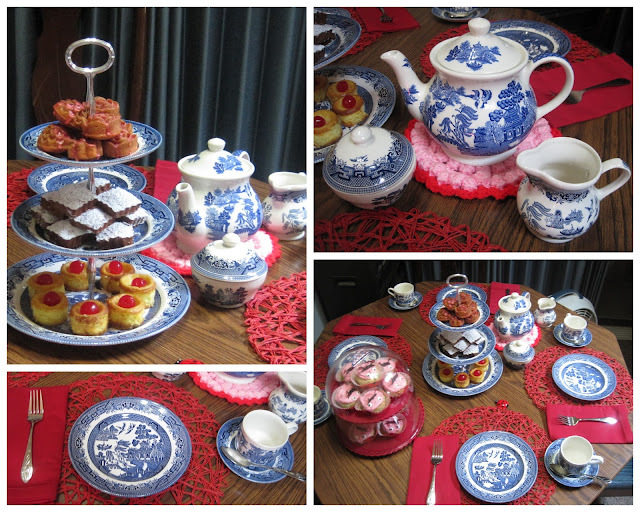 The fancy part of this tea party is my cooking column for this week, so I'll wait to share recipes after it runs! Check back next week for an update with recipes! I'll tell you now, though, that the little cheesecakes have yellow summer squash in them! My plate looked pretty good! Yummy! I chose my Blue Willow china because it was handy and I love the old pattern. I like to tell Phoebe the story depicted in this pattern, although today we didn't have time for that. We had lots of school talk going on! And one last picture ... of a very tired waiter who is parked on his rug with his favorite magazines! I'll be sharing this with a few blog parties this week, so make sure you click through to visit some of the other posts! Go to my home page, first though ... I have some other new posts that you'll love. I've baked bread using Apple Ale instead of plain old beer ....... and I've posted the 3rd in my series of "12 Days of Leftover Turkey"!! When my daughter announced that she was making beer bread today because she had too much beer in the house, I decided I should try a loaf with the Apple Ale I recently bought and will never drink! I like it, but I'd much rather have a glass of good wine ... apple wine! It smelled so good while it was baking ... and it tastes just as good! I put dried Southern Illinois blueberries in it and dried watermelon seeds, instead of nuts. Scrumptious. Here's the recipe. I'm sharing this post with some blog parties, so make sure you click through to see the other posts ... but first, check out my home page. 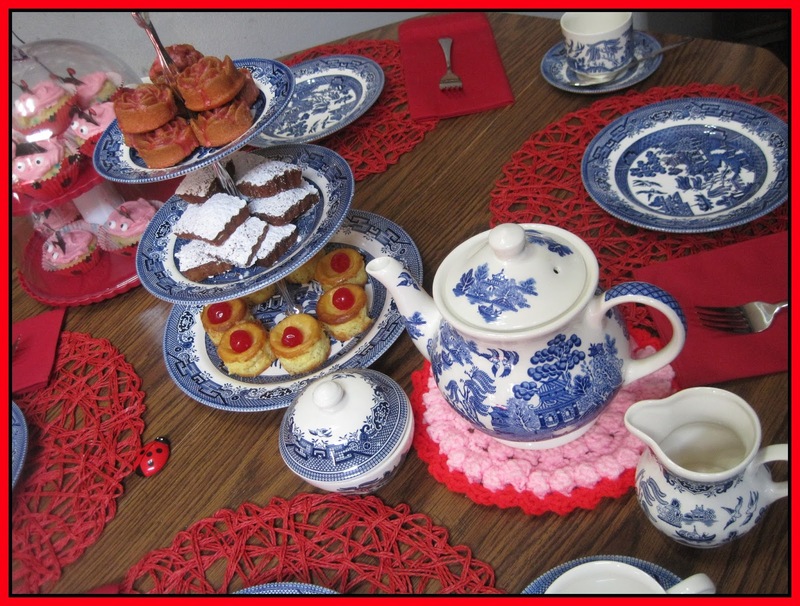 I'm posting some Ladybug Tea Party pictures and the 3rd in my series of Twelve Days of Leftover Turkey! Mix all the ingredients together in a big bowl. Oh, that is easy! Bake in a greased and floured bread pan at 375 degrees for 35 - 40 minutes. The bread should be brown on top and a pick should come out clean when you insert it in the middle of the loaf. While the bread is still hot, brush melted butter over the top of it. Let it cool in the pan for 15 minutes before inverting it. It is really good served warm with soft butter and honey! Turkey Pot Pie with Angel Biscuits! The 3rd in a Series of 12 Days of Leftover Turkey! I cannot begin to tell you how many batches of Angel Biscuit dough I make in the course of a year! It is my "go to" for many things. You probably already know that in addition to making the best biscuits ever, the dough makes incredible fried doughnuts and sweet rolls. You can roll it thin and use it as the topping for casseroles and you can pinch it off in little balls and make delicious savory or sweet monkey bread! 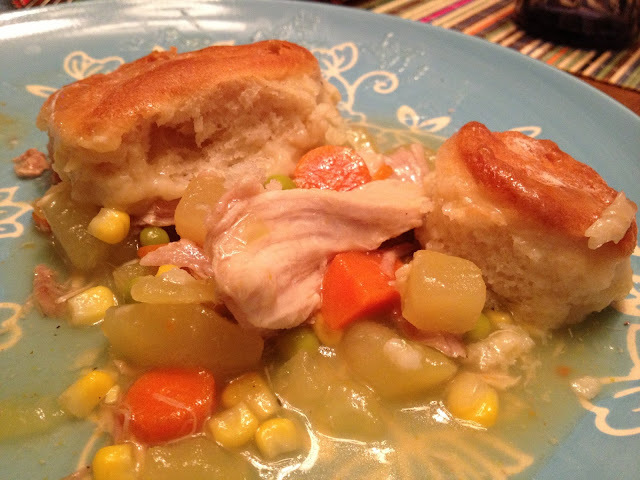 I'll share the recipe for the biscuits, but I also want to share the recipe for this delicious pot pie made with left over turkey! I never get tired of having bags of turkey in the freezer. It comes in handy for so much! In a big pot of water, boil the vegetables until they are tender. The celery and carrots will take a little longer, so you can start them first and add the remaining vegetables later. Drain the water from the vegetables and add the chicken stock, all the seasoning and the turkey meat. Bring this to a simmer and add the corn starch slurry to thicken it. When it is thick pour it into a 3 quart casserole dish (a 9x13 inch works well) and top it with several angel biscuits. Bake it in a preheated 400 degree oven for 15-20 minutes. The biscuits should be nice and brown and they will have absorbed some of the broth. Let the casserole cool about 10 minutes before serving it. **You can top it with pre-packaged refrigerated biscuits. Now, mix all the ingredients together until you have a nice dough. It might be a little bit sticky, but that is fine. Put it in a large covered plastic container and refrigerate it over night. Pinch off the amount you want to bake; roll or pant and cut your biscuits; place on a greased heavy pan; bake at 425 degrees for 15 minutes. This dough will keep in the refrigerator for about 10 days. You can also freeze it, but let it thaw in the fridge the night before you want to use it. Plan for the dough to expand while refrigerated, so put it in a container with lots of extra space. I'll be sharing this with a few blog parties, so make sure you click through to see all the other posts! 2nd of a Series of 12 Days of Left-over Turkey! This is a great recipe to use to stretch a bag of left-over turkey meat into 6 good portions of sauce for pasta or rice. If you've frozen your turkey, you could be eating this a couple months after Thanksgiving, but if you are using it up quickly ... there is no better way to get over all that "turkey and dressing" theme than to serve Italian! Of course, I cook turkeys all year long and enjoy having bags of the meat in the freezer ... but I'm never amazed to learn that some families just have turkey a couple times a year. I always think they are really missing out! Place the olive oil in the bottom of the crock pot and turn it on high. Wait about 30 minutes, then add the vegetables and spices and stir them around in the olive oil. Lay the turkey pieces over the vegetables and pour the tomato sauce over it. Put the lid on the pot and let it cook for 2 hours. In this short amount of time, the vegetables should be done and the flavors will have combined for a delightful sauce to serve over pasta or rice. I'm sharing this post with a couple parties this week, so make sure you click through to visit the other folks. 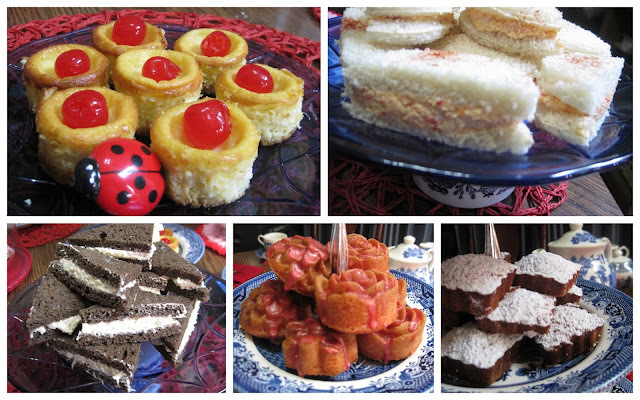 But first, visit my home page or my "Turkey Left-overs" page ... so you can see the other recipes. I'm posting a series of 12 recipes to use turkey in ... and you'll want to visit often so you'll be ready when the big day arrives ... the day AFTER Thanksgiving! Oh, my! I have been so busy this summer ... that I haven't done anything in my house. In fact, if the vacuum cleaner didn't almost run itself, that wouldn't have gotten done either! My little team of teachers and I have taught over 1,000 people how to cook ... in 5 counties ... day and night classes. 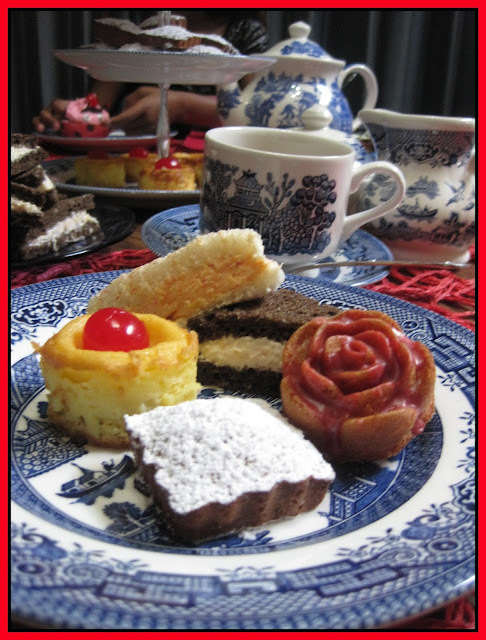 We've published a couple special newspapers filled with recipes ... a little cookbook with favorite recipes in it ... and created a set of 1800 recipe cards for the students. Oh, wow! So, when I saw these cute cobalt blue canisters in one of our local stores a week ago, I just knew I needed them to kind of launch what needs to be a month of deep cleaning and getting ready for fall. That sounds good, but I really only have a week to get all that done ... because I start another big consulting project on August 27th. So, for now ... enjoy this splash of cobalt blue. 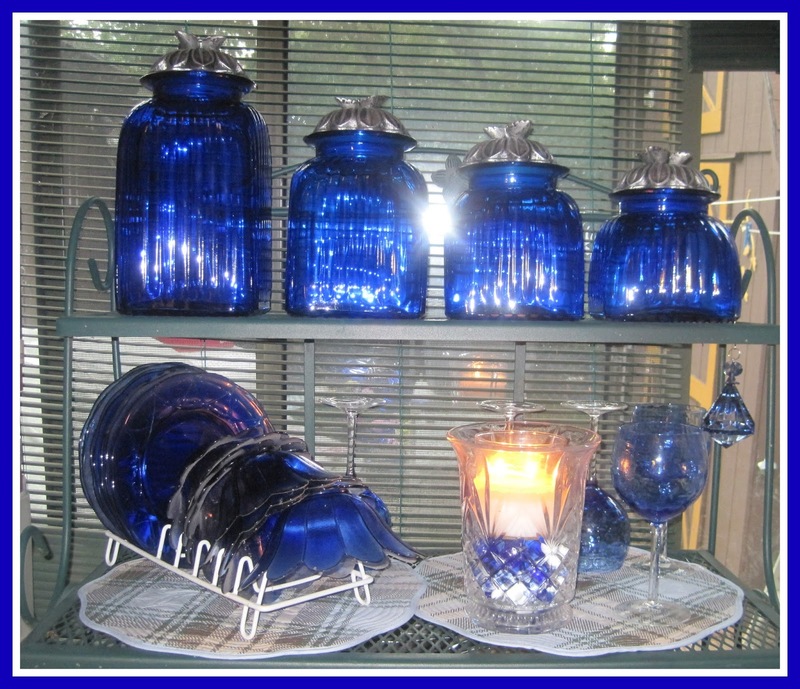 Eventually, my sunroom will be filled with more of this pretty stuff ... and I'll post more pictures! I'm sharing with a few parties, so make sure you click through to visit the other sites! Next Day Turkey a la King! 12 Days of Left-over Turkey! my house ... to have brunch on the Friday after Thanksgiving Day. For almost 40 years, the menu has been the same: Turkey a la King! My husband and I were married the week before Thanksgiving, and I distinctly remember that first big meal I fixed for the family. 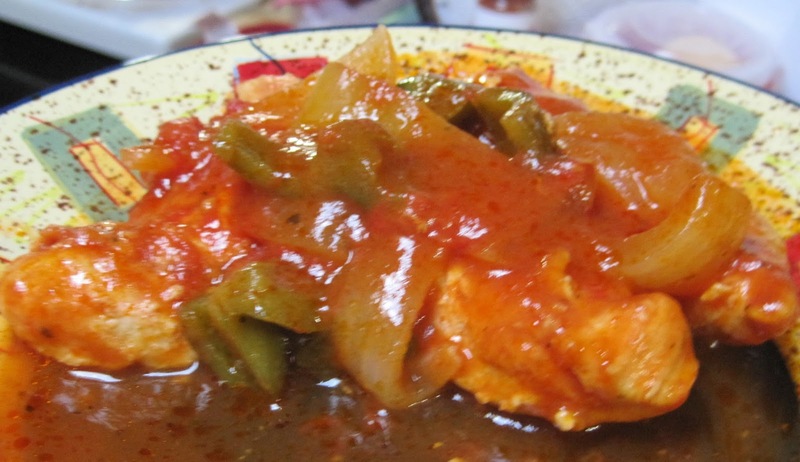 The next day, as I looked at all the left-overs, I opened up my blue and white Good Housekeeping cookbook and found a picture of Chicken a la King ... and that started the tradition. Now, I wasn't new to the dish. When I was in high school, my mom would keep Banquet brand boiling bag portions of Chicken a la King in the freezer. I walked home for lunch ... had plenty of time to fix one of those ... and still get back to school in time for afternoon classes. I loved the stuff! Good news for me. My husband loved it too, but his first taste came on our little kitchen table during the first week of marriage! I'm not sure what he loved the most ... the Thanksgiving Day turkey ... or brunch the day after! Melt the butter in a heavy skillet and sauté the mushrooms, onions and celery until the vegetables are soft. Blend in the flour and add the chicken stock. Continue to stir and add the turkey, peas and milk. The sauce should begin to thicken. As a last step, add the olives and a little olive juice for flavor. Salt and pepper to taste. Serve this over toast, biscuits, toasted corn bread or puff pastry. Now remember … the purpose of this recipe is to use up left-over turkey and fixin’s. If you have left-over peas and mushrooms from Thanksgiving dinner … use them instead of fresh mushrooms and a new batch of peas. If there are pearl onions in your left-over peas … even if they are in cream sauce … add all of it and skip the onions in the recipe! If you have a few olives left in the jar … use them. They only make this recipe better. I’ve even been known to ‘un-stuff’ celery and eat the stuffing on a cracker, so I could use the celery in my a la King! I doubt that I have ever actually made this recipe with chicken or turkey stock because I always use left-over giblet gravy! The other thing to keep in mind is that although this recipe easily makes 6 – 8 portions, if you have a crowd to feed, you can add more milk and gravy/stock … without adding more turkey. The cream sauce … enhanced with the salty flavors of the olives … is really good with or without turkey, so you can stretch the recipe by increasing the amount of sauce! This is just one way to use turkey that is left from your big dinner. Save the big chunks for something else, because the bits that you pick off the carcass are perfect for this recipe. I'm going to share this with a few parties, so make sure you click through to visit! Just because I want to ... and I don't do the whole thing, but by August, I'm ready for a turkey. Sometimes I fry the turkey ... sometimes I put it on the spit on the bbq grill ... but today I roasted it in the oven. The temperatures stayed in the 70s today, which is pretty unusual for August in Southern Illinois ... so it didn't bother me to heat up the kitchen! I did make an interesting twist on my traditional dressing. I wanted to make sure it screamed Southern Illinois, so I filled it full of the fruity flavors of dried blueberries and a peach ... both from just down the road in our orchard county. I used part of a loaf of Anadama bread I made a few weeks ago and froze. 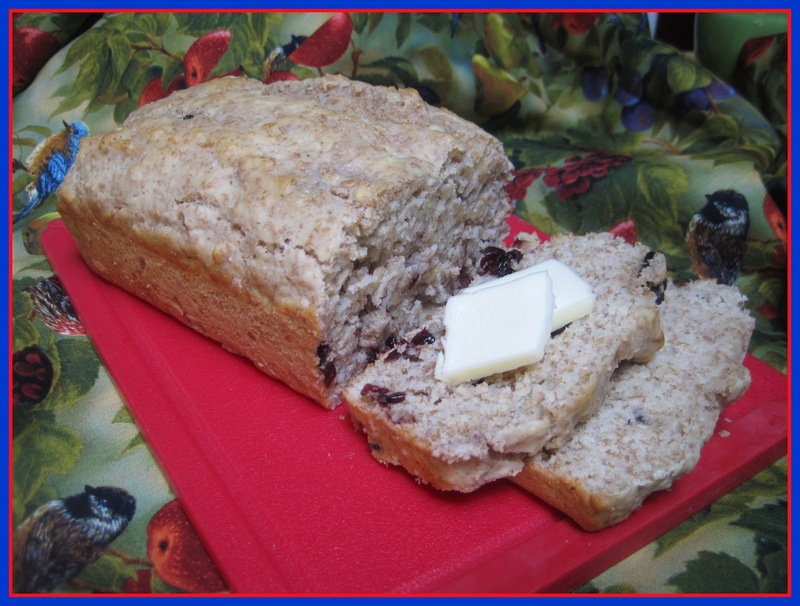 Anadama bread has corn meal in it and sorghum molasses, so adding the fruit seemed like the perfect thing to do. I also put a little bit of honey in it and I used local honey to baste the turkey, too. I fixed a 22 pound turkey, so I had plenty to freeze. There's a method to my summertime madness! I'm going to document all the things I do with the left-overs and use it in one of my cooking columns right before Thanksgiving 2013! 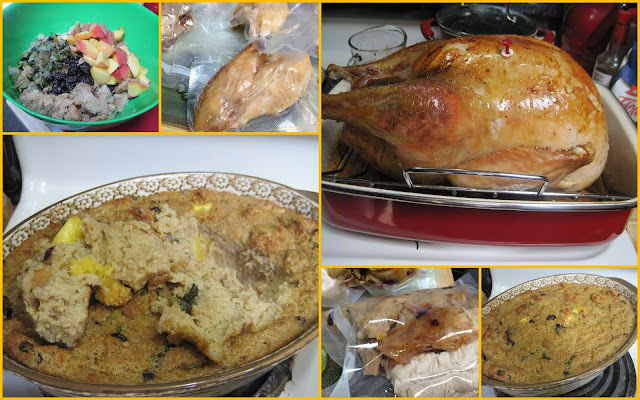 My readers and cooking class students frequently ask me what to do with left-over turkey. 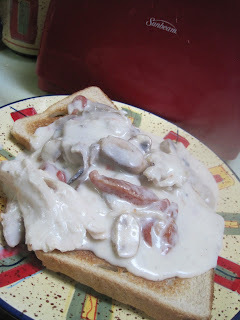 Now, I'll have pictures and recipes that will begin with brunch tomorrow ... one of my favorite things ... Turkey a la King! Then, I'm fixing turkey pot pie with homemade biscuits on top ... for my daughter and family. They are returning from vacation and they'll be starved, but too pooped to cook! So, I promised I'd deliver dinner. As I prepare all these left-over delights, I'll be posting on this blog and will be adding the posts to a special page entitled "Turkey Forever"! So, you'll want to return from time to time and check out the additions.